Ranveer Singh surprised his Lootera co-star Sonakshi Sinha while she was in the middle of a photo shoot. Ranveer Singh is currently busking on the success of his last release Gully Boy which also stars Alia Bhatt and Siddhant Chaturvedi in pivotal roles. Ranveer, who is known for his quirky personality, has a lot of fan following. His super hyper personality has made many Bollywood celebs question the actor what does he eat to stay energised all the time. The Padmaavat actor keeps doing something or the other that leaves his fans awestruck. Recently, he decided to surprise his friend Sonakshi Sinha in the middle of a photoshoot. Ranveer, also known as Baba, crashed Sonakshi’s photo shoot and started posing behind his Lootera co-star. Sonakshi could not hold her laughter nor could she stop herself from sharing the hilarious moment with her fans. She took to her Instagram story to tell the world what happened when Ranveer crashed her photoshoot. 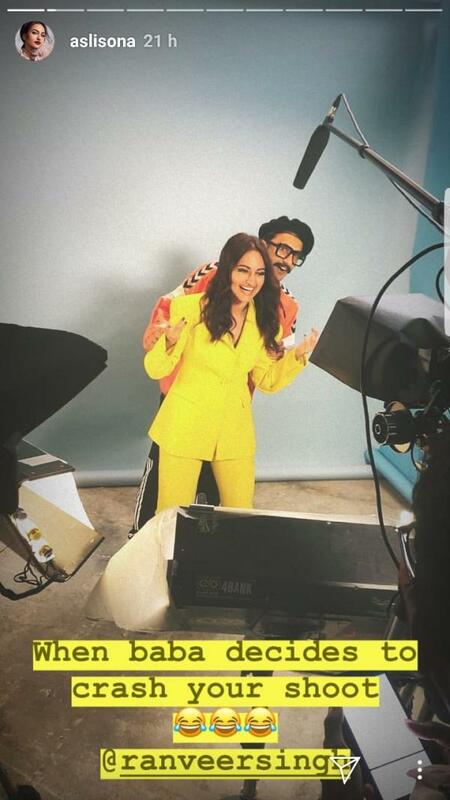 In one of the pictures shared she captioned “When Baba decides to crash your shoot.” along with that she added the laughing emoji and tagged Ranveer. On the professional front, Ranveer was last seen in Gully Boy which did wonders at the Box Office. He will next be seen in 83′ which is based on India’s win in the 1983 World Cup. Sonakshi, on the other hand, will next be seen in Kalank which has an ensemble cast of Madhuri Dixit Nene, Sanjay Dutt, Alia Bhatt, Varun Dhavan and Aditya Roy Kapur. The film is a period drama which is set on the 1940s. Directed by Abhishek Verman and produced by Karan Johar and Sajid Nadiadwala, the film which was supposed to release on April 19 will now hit theatres on April 17.